Can the Lions Cope With Blitzkrieg Rugby? Rugby is a game that is based on the laws of battle. The forwards represent the infantry, the backs the cavalry, and the kicker the artillery. Much like warfare, team styles of rugby fall on a spectrum with attritional warfare on one end and manoeuvre warfare at the other. In the same way that the Wehrmacht shocked its opponents with revolutionary tactics in the opening stages of World War II, the reason why the All Blacks have dominated the world rugby stage for over a decade is that they’re conducting a blitzkrieg while everyone else is in World War I mode. In other words, the All Blacks are fighting with manoeuvre warfare while everyone else is in the attritional mindset. The concept of the blitzkrieg was based around two general principles: the schwerpunkt and the kesselschlacht. A ‘schwerpunkt’ (“heavy point”) refers to a specific point in the enemy defensive line that was targeted for a sudden, intense rush of artillery, armour and infantry, with the specific intent of breaking the line and driving beyond. Usually this took the form of an intense artillery barrage from multiple batteries concentrated on a single point in the line, followed immediately by a heavy tank charge with the intent of breaching the line, and then infantrymen into the breach with the intent of holding it and keeping it open. Usually there was more than one schwerpunkt, the idea being that multiple columns of armour would break the enemy line at various points and then, as they penetrated deep into the enemy interior, link up in what was called a pincer movement, as it cleaved off a chunk of the map in a manner akin to the pincers of an insect. When two or more columns of armour met in the interior of the enemy, that essentially meant that all of the enemy forces between the initial front lines and the two vast lines established by the armour were surrounded in the centre, making it possible to pin them with artillery fire. Because this led to those enemy forces being rendered into chaos in much the same manner as water boiling in a kettle, this was known as a ‘kesselschlact’ (“kettle battle”). 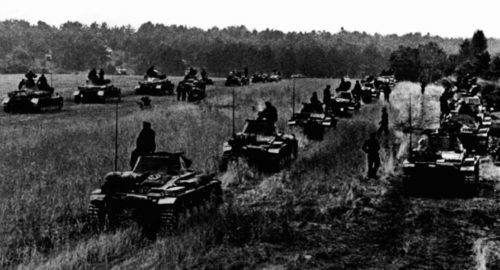 The reason why this tactic – called blitzkrieg by the British – was so successful is that is allowed the attacker to break up tens of kilometres of enemy defensive line in one movement. This was a drastic change from the usual World War I tactic of winning a few hundred meters at a time in a slow, bloody grind that was vulnerable to counterattack. Because so much of the enemy line was broken so quickly, it had a tendency to collapse before it could regroup, as was seen in France and the opening weeks of Barbarossa. So much for the military lesson. The two distinct styles of rugby union played in the world today could be roughly referred to as the Atlantic and the Pacific styles. The Atlantic style is the traditional, attritional style of rugby favoured by the Northern Hemisphere sides and by South Africa and Argentina. It is otherwise known as “tight”, “10 man” or “up the jumper” rugby and refers to a love of mauls, scrums, pick and gos, high bombs, one-out crashballing, pinpoint kicking and generally just mudwrestling – essentially World War I-style tactics in miniature. The Pacific style, championed by the All Blacks, is also played by Australia, Fiji, Samoa and Tonga. Japan used it when they shocked the Springboks at the 2015 Rugby World Cup, and Argentina flirt with using it. It is derided as “loose”, “festival” or “basketball” rugby by the Northerners. Those who play this style love offloads, cut-out passes, goosesteps, wrap-around plays, fends that knock the fullbacks over, sudden and untelegraphed changes of attack direction, chipping and regathering, passing in front of the receiver, and perfectly-timed passes that allow the winger to skin the covering tackle on the outside. Done poorly, the Pacific style can disintegrate into a shambles reminiscent of a scratch Barbarians game, in which the players are trying to force every pass and the opposition can win simply by waiting for opportunities to counterattack. Done well, the Pacific style gives us blitzkrieg rugby. Like the military blitzkrieg, successful use of this tactic is much more than just throwing the ball around and having big players who can run fast. It also requires a particularly high degree of co-ordination. If there’s one way in which the All Blacks are always more effective than their opposition it is in their ability to support a line break. Almost every time an All Black breaks the line he has options for unloading. This is a consequence of the fact that All Black players have usually played rugby since they were small children and have an intuitive ability to read the game that has been refined over more years than the other teams’ players. In the same way that the Soviet Union stopped the Nazi blitzkrieg by successfully using multiple lines of defence, the Lions will have to accept and adapt to the fact that their first lines are going to get broken. In other words, if the Lions are going to stop the blitzkrieg rugby of the All Blacks they are going to have to scramble like demons. This will require a high degree of skill as the defenders will have to make correct decisions at extreme pace. Usually these decisions involve which lines to run so as to shut down space in order to prevent the player making the line break from setting up an outside runner, as it is this aspect of the game where the All Blacks can devastate teams in very short order. The blueprint for this ought to be the Irish win over the All Blacks in Chicago last year. The Irish defence retained its cohesion in that game despite the rapid manoeuvre attack of the All Blacks. If the Lions cannot at least equal the defensive cohesion of that Irish team, the All Blacks will cut them to shreds. Furthermore, without a kicker near to the class of Dan Carter the Men in Black do not have a reliable Plan B. It’s blitzkrieg rugby or nothing – so the British and Irish can be expected to have an excellent game plan. Rugby union is, and always has been, a game of skill. The All Blacks will play to a gameplan which puts the skills of all 30 players under the highest possible stress at the highest possible tempo, because these circumstances give the decisive edge to the most skilled side, and they believe themselves to have the superior skills. If the Lions are going to stop this blitzkrieg they are going to have to make intelligent decisions extremely quickly to an intelligent gameplan. The competitiveness of the series will hinge on their ability to do this. Next Next post: Poetry K-Hole 5: Hypnos Lost.